Bark & Co., the doggie-themed technology company best known for its dog treat-delivering subscription business BarkBox, and more recently, its vet care-on-demand service BarkCare, has just closed on 15 million in Series B funding. The company raised $10 million in inside round led by previous investor Resolute.vc, along with RRE, BoxGroup, Lerer Ventures, Bertelsmann Digital Media Investments, Slow Ventures, Daher Capital, CAA, and Vast Ventures, with the remaining in debt financing from City National Bank. “We kind of went this middle route,” he says. “[Investors] made an offer that let us put a little bit of money in the company, and we coupled that with a line of credit. Basically, it’s cushion in case the world makes a turn on us that’s unexpected, or if other opportunities come along,” adds Meeker. The new round increases Bark & Co.’s valuation by 10-11 times over its previous A round, from April 2013. As of February this year, the company reported a $25 million revenue run rate, and is projecting to grow that 3 or 4 times over by next year, at which point it will consider a further growth round. Another reason it wants to hold off on a larger growth round is to give a couple of its newer businesses more time to scale – and yes, Bark & Co. has several of those. People really love their dogs, and Bark & Co. capitalizes on that through a number of different avenues. Founded in 2011 by Meeker along with Henrik Werdelin and Carly Strife, Bark & Co. initially focused on subscription-based e-commerce via BarkBox. That service sends out a monthly box of dog treats and toys, based on your dog’s size. Today, BarkBox has 200,000 paying customers who pay anywhere from $18 to $29 per month (depending on their subscription) for a box a goodies. The company makes about $20 per box, but delivers $40 to $50 in retail value, says Meeker. Subscribers, once they join, seem to stick around, too. 75% commit to a longer-term plan, and retention is “well north” of 90%. A few months ago, Bark & Co. even figured out how to get more money out of this enthusiastic dog-lovin’ user base by offering the option to add a toy for an additional $9 per month. And 20% of its customers signed up. Meanwhile, Bark & Co.’s newly launched vet care service BarkCare has made hundreds house calls since its February debut in New York. Offering on-demand vet appointments for more routine matters, like puppy shots, rabies vaccines and other minor ailments, the company has since expanded to the San Francisco Bay Area and has doubled the number of visits in its second quarter over the first. The plan now is to do the volume of a normal city vet practice – each city at around $2 million per year – before expanding the business into other markets. 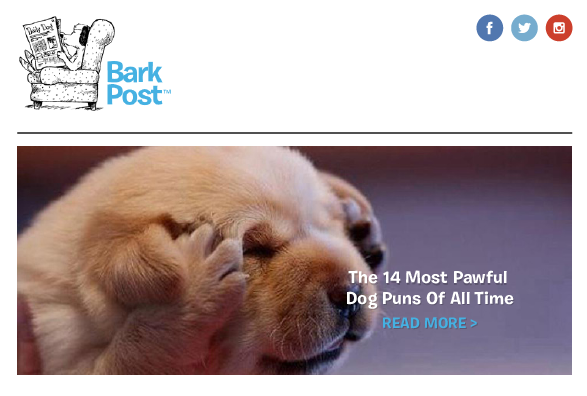 And if that’s not enough, Bark & Co. also runs a content portal called The BarkPost, which has grown from 1 million visits in December to now 10.5 million visits as of last month. That business, which also serves as lead gen for BarkCare and BarkBox, is only now starting to generate revenue through sponsored posts from brands like FreshPet, Roomba, 1-800 Flowers and others. The site was run by a team of one all last year, and now has a 4-person crew, including its first biz hire in April. The company also recently rolled out a new mobile application for dog adoption called BarkBuddy, which works sort of like a “Tinder for dogs” – meaning that you swipe left or right to indicate whether or not you love the doggie’s photo that displays. When you like a dog, you’re then pointed to the local shelter where the dog can be adopted, thanks to its integration with pet data aggregator, Pet Finder. Some time later this year, BarkBuddy will start helping tie Bark & Co.’s businesses together by offering pet “test drives” where you get to take home a dog for a weekend to see if it’s a fit for you and your family. The idea is that the dog would be vetted via BarkCare vets, and you could order a bunch of starter products like leashes or bowls through Bark & Co. as part of this package deal. If Bark & Co. can get people to commit for the weekend, they believe a number of people will end up falling in love with the dog and want to keep it. Another app just around the corner, BarkCam, will be just a bit of fun – you can dress up your doggie’s photos with filters, stickers, quotes and meme text. Today, Bark & Co. has grown to 54 employees, up from 45 at the beginning of the year, the majority based in New York. Of course, if you count the number of dogs hanging around the office on any given day, though, you can up that number by another dozen or so.